Six years ago, a number of GTWN International Board Members including Bridget Cosgrave, Candace Johnson, Vicki MacLeod, Sallye Clark, and Walda Roseman came together with Women Executives in the Pacific Islands. amongst others Ellen Strickland, the then President of the Pacific Internet Society and Anne Matson from New Zealand, to create OWNSAT – Oceania Women’s Network Satellite, which then became one of the first and largest shareholders in Kacific. We were extremely pleased that Kacific received the “Better Satellite World” Award on 03 December 2018 in London, very much confirming our desires and hopes of bringing indeed a “better world” to the inhabitants of the Pacific Islands with high-throughput satellite Internet. 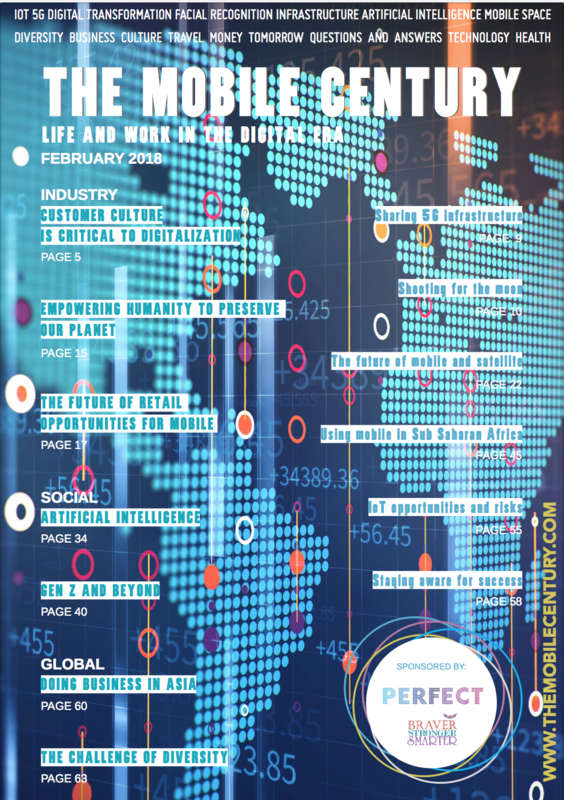 The Space and Satellite Professionals International (SSPI) established the Better World Satellite Awards in 2015 to honour companies whose technology and activities have had positive impacts on the world around them. From visual image sensors that produce images for resource, disaster and ocean monitoring, to volunteer-based organisations that reconnect disconnected communication links in disaster zones, winners of the Better World Satellite Awards are fantastic, real-world examples of the positive impact of satellites. At the 2019 Better World Satellite Awards dinner, one satellite company toasted the socially-minded award with a murky brown liquid. The drink was kava; a traditional brew shared ceremoniously throughout the Paci c Islands and made from the root of a locally grown crop. And the company; Kacific Broadband Satellites, an HTS satellite operator that brings affordable high-speed broadband to communities across the Pacific and South East Asia. Led by founder and CEO Christian Patouraux, Kacific has introduced Ku- band broadband satellite service into Fiji, East Timor, Papua New Guinea, Indonesia, the Solomon Islands, Kiribati, Vanuatu, Tonga, Niue, Samoa, American Samoa and Tuvalu. Working with local partners, these proof-of-concept services connect hospitals, health clinics, schools, libraries, post offices, police stations and many other public institutions in rural areas where terrestrial broadband infrastructure is not an option. The company’s first Ka-band HTS, Kacific, will launch into orbit later this year and existing connections will be upgraded to Kacific, delivering even higher speeds. Currently under construction at Boeing, Kaci c1 will deliver bandwidth via 56 spot beams which have been placed over 25+ markets in Asia Pacific including the populous regions of Indonesia and Philippines, as well as small island nations such as Tonga, Niue and Vanuatu. Kacific enables the pro table connectivity of markets that larger operators, which are deterred by the geographical remoteness, under-developed ICT infrastructure and small population sizes, often overlook. Kaci c offers inexpensive, small and easy- to-maintain ground equipment and high- speed internet at wholesale prices to local service providers throughout the region, making such providers into partners and stakeholders in their areas’ futures. The VSAT terminals that end-users access the service through start at 90cm in diameter – making them transportable to rural areas and remote islands by boat, car or even on foot. The terminals run on low power and can easily be solar-powered. Such robust, compact terminals are crucial to making the service accessible to local businesses and communities. The value of Kacific’s flexible deployment and rapid response in time of emergency was demonstrated on 20 January this year, when Tonga Cable suffered an outage in the submarine cable network that connects the island nation to the outside world, plunging the whole country into digital isolation. Tonga Cable System is an 827 kilometre long submarine cable system, funded by the Asian Development Bank and the World Bank. It has cable landing points at Sopu in Tonga and Suva in Fiji. Despite the serious impact of the outage, there was no clear timeframe to restore Tonga Cable’s service, meaning that 110,000 residents, businesses and importantly government services, were facing an extended period without connection to the outside world. The sole international service available was provided via a Ku-band satellite network, operated by Kaci c, and supplied in- country by ISP, EziNET. Kacific’s satellite service provided essential connectivity while Tonga Cable carried out repairs. The flagship project in Kacific’s proof-of- concept service connects the Vanuatu Interisland Telemedicine and Learning (VITAL) Network. Located in the South Paci c, Vanuatu is made up of around 80 islands that stretch 1,300 kilometers. With a population of just 263,800, Vanuatu places 125th of 187 countries on the Human Development Index, with high maternal and infant mortality rates. Travel between its islands is expensive and difficult due to weather and infrequent travel options. The VITAL Network began when a remote village of Naviso on Maewo Island, a community with no cellular network, successfully campaigned for internet access to communicate with doctors at a provincial hospital on a larger island. The island is home to around 3,570 people. Utilising Kacific’s satellite services, primary healthcare workers in the VITAL Network can chat message or video conference main island doctors quickly to treat and transport patients in life threatening circumstances. They can also contact specialist doctors for diagnosis and advice and use the internet for learning and up-skilling remotely. Shortly after the introduction of services, the Telecommunications and Radiocommunications Regulator (TRR), Dalsie Baniala, spoke with the community, imploring them to show leadership in how they used the internet connection for positive social outcomes. “The internet broadband network will bring in all sorts of rubbish among the good and it is for you to manage yourselves because bad choices will spoil the community,” she said. The Maewo sites were the first connected in the VITAL Network and provided the blueprint for the Government to replicate the service in other islands. “It is important that we on Maewo provide the leadership on how to use the facility in the right way,” commented Ms Baniala. In the first six months, two village clinics on Maewo Island engaged with doctors over 1,250 times and helped 32 patients. This included six life- threatening cases involving mothers and children, and ten patients who would have been permanently disabled without intervention. A breakdown of the communications revealed that 44 percent of the communications were about patient care, 26 percent for relationship building, 21 percent administrative, 6 percent public health, and 3 percent education. The majority of communication (96.7 percent) was through chat message. The Network is also used by local teachers and students to access information, and tertiary students who can complete online study through the University of the South Pacific Emalus Campus in Port Vila. Kacific’s network data reveals a strong and continuous demand for internet. 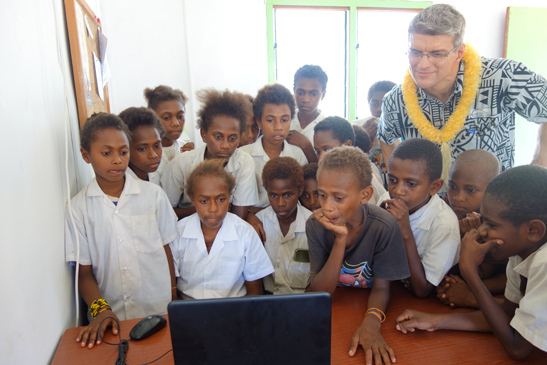 In 2018, the primary schools and clinics on Maewo island were using between 200 Gbytes – 500 Gbytes per month. The VITAL Network was a result of multi- stakeholder engagement including local government organisations; international development agencies; the Maewo community; and network suppliers Telsat, a local telecommunications company, and Kaci c Broadband Satellites. This flagship project is opening doors for other villages in Vanuatu to follow suit and join the Network. 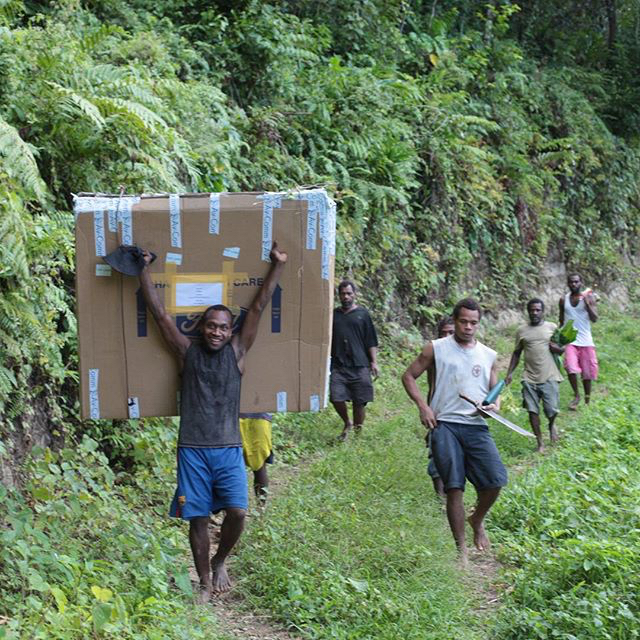 Through collaboration and digital education, villagers living in outer islands are making good use of satellite connectivity to receive the same level of healthcare and education opportunities as those in Vanuatu’s main provinces. Dr. B. Leodoro and S. Leo. (12 September 2018). Vanuatu’s VITAL network to save lives. Present- ed at Asia Paci c Network Information Centre (APNIC) 46 Conference in Nouméa, New Caledo- nia. Retrieved from https://www.slideshare.net/ apnic/rural-community-wi -in-png-114162207 J Cullwick. (04 August 2016). Regulator calls on Maewo community to use telemed- icine network wisely. The Daily Post Va- nuatu. Retrieved from http://dailypost.vu/ news/regulator-calls-on-maewo-communi- ty-to-use-telemedicine-network-wisely/article_ fe7fe294-8cc7-5f52-b818-26174c875393.html Kaci c Broadband Satellites. (January 2019) Monthly data usage from Maewo Island sites. Candace Johnson represented OWNSAT at the “Better Satellite World” Award Ceremony where its investee company Kaci c won the top prize. The Ambassador of Vanuatu, the President of Boeing, and the President of NewTec joined Kacific Board Members and CEO Christian Patouraux on this prestigious occasion.